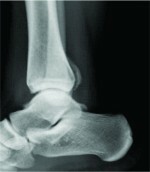 Diagnosis of Trevor disease of the ankle is challenging and arthroscopy is a valuable option. Department of Orthopaedics and Traumatology, Sultan Qaboos Hospital, Salalah, Oman. 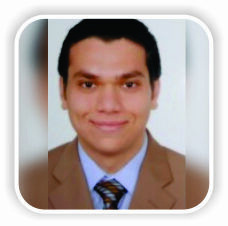 Department of Orthopaedics and Traumatology, Assiut University Hospitals, Assiut, Egypt. Introduction: Dysplasia Epiphysealis Hemimelica(DEH)is a rare developmental epiphyseal disease characterized by asymmetri cover growth of cartilage in the epiphysis, histologically mimics osteochondroma of the joints. The disease mainly involves ankle, knee, and tarsal bones. Small number of cases are is reported in literature particularly those managed arthroscopically. Case Report: The present study reports a case of Dysplasia Epiphysealis Hemimelica (DEH) developed in the talus in male child presented with swelling, pain, and inability to put weight. 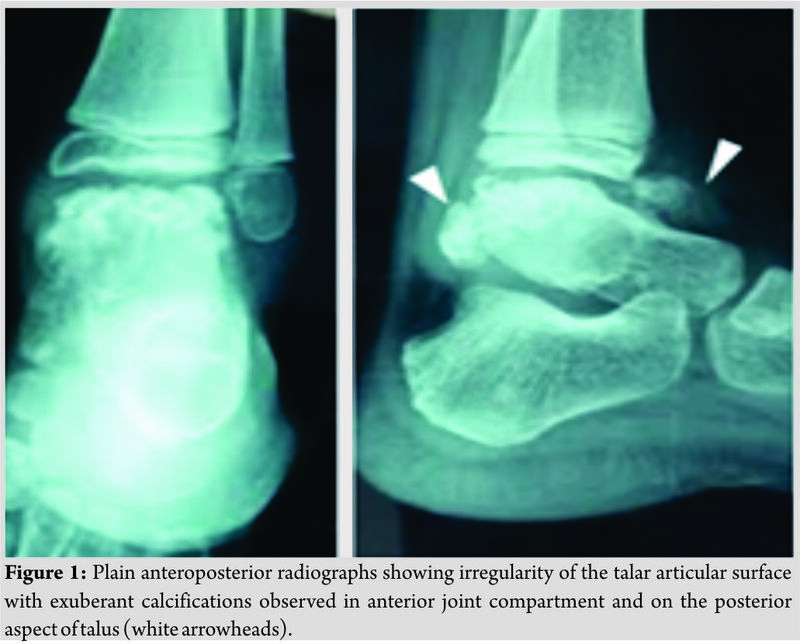 Radiographs showed irregularities of the talar body with a large loose body in the anterior joint compartment with excessive overgrowth of the anteromedial and posteromedial aspects of the talus managed by combined anterior and posterior ankle arthroscopy in a single session and showed improvement of both pain and range of motion in the short-term follow-up. Conclusion: Trevor disease of the ankle is a rare disease that needs high index of suspicion for diagnosis and arthroscopy can be a minimally invasive option to improve pain and range of motion. This case report demonstrates basis upon which such a rare disease can be diagnosed and shows the arthroscopic surgical technique details and its possible value in the outcome of these cases. Keywords: Ankle arthroscopy, Dysplasia Epiphysealis Hemimelica, Trevor. Trevor disease which is sometimes known as Dysplasia Epiphysealis Hemimelica (DEH) is a rare non hereditary developmental skeletal disorder that affects epiphysis. This disorder was first described in 1926 by Mouchet and Berlot and was named tarsomegaly . In 1950, Trevor reported eight cases and, hence, the name “Trevor’s disease”. In1956, Fairbank studied 14 cases and suggested the term DEH. The reported incidence is one in million and the etiology remains unknown . About 200 cases of DEH have been reported in literature . Most cases were treated surgically by open removal of the exostosis, and the rest of cases was conservatively managed. Arthroscopic management in literature is not commonly reported [5, 6]. Onset of symptoms occurs usually during early childhood, males to females ratio area about 3:1. The most common presentation is bony mass in joint followed by swelling and limitation of motion . 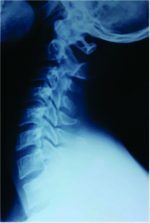 Diagnosis can be confirmed by plain radiographs, computed tomography (CT), and magnetic resonance imaging (MRI) scans. Treatment depends on deformities, symptoms location, and amount of epiphyseal involvement. Asymptomatic patients required no treatment, if the mass causes epiphyseal asymmetry or causing mechanical block of the ankle dorsiflexion and/or plantar flexion, then resection of the exostosis is required . MRI determined bone marrow edema adjacent to the bony protuberances, synovitis around the lesions and some amount of joint effusion (Fig. 2); on a CT scan, the exact size and location of bony masses was assessed (Fig. 3). Functional assessment was done using American Orthopaedic Foot and Ankle Society (AOFAS) hindfoot scale. The pre-operative score was 68/100points. The patient had combined anterior and posterior ankle arthroscopy in a single session, under general anesthesia. Important landmarks were marked on skin using a permanent marker pen. These included tibialis anterior tendon, peroneus tertius tendon, and Superficial Peroneal Nerve (SPN) for anterior ankle arthroscopy and borders of the Achilles tendon for hindfoot arthroscopy. The patient was positioned first in supine position for anterior arthroscopy. The medial portal was created first just by a vertical skin incision just medial totibialis anterior tendon at the level of joint line above the palpable bony mass,then a mosquito forceps is used to spread the skin. The anterolateral portal created under vision using spinal needle with transillumination to avoid injury to branches of SPN. Routine arthroscopic examination of the ankle joint was made and the large bony fragment in medial gutter came into view, release of soft tissue attachments of this bony fragment to the talar neck and anterior capsule was made using soft tissue dissector, then the fragment was extracted by arthroscopic grasper. The entire articular surfaces of the talus and tibial plafond were inspected. A loose cartilage flab was found in anterolateral aspect of talar dome for which debridement was done using a small curette and motorized shaver. 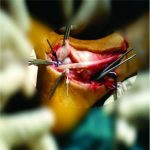 The articular cartilage defect after resection of the loose flap measured about 6 mm2 and marrow stimulation using microfracture awl was done. Skin incisions were closed using 2/0 prolene. During same session patient was shifted to prone position and hindfoot endoscopy started through standard posteromedial and posterolateral portals made just next to medial and lateral edges of Achilles tendon and just above line drawn parallel to sole of foot in neutral position from tip of lateral malleolus. The working space created using shaver and flexor hallucis longus tend on exposed as most important safety landmark for the protection of posterior tibial neurovascular bundle, then bony prominence at posterior talar process was resected using osteotome and motorized a brader, skin incisions were closed using 2/0 prolene. Sterile dressing was applied and no splintage was used. Intraoperative fluoroscopy was used to confirm satisfactory removal of all bony masses (Fig. 4). Postoperatively, range of motion exercises without weight-bearing was encouraged from the 1st day. Extracted tissues were sent for histopathological examination which revealed mature bone trabeculae surrounded by mature hyaline cartilage which coincides with the diagnosis of Trevor disease. There was no evidence of atypia or malignancy. We followed the patient up at our out patient clinic at 2 week intervals. Pain and limitation of motion improved within 2 weeks. Range of motion exercises and non-weight bearing continued for 4 weeks, then the patient started partial weight bearing and full weight bearing regained at 6 weeks postoperatively. Post-operative AOFAS score at 8 weeks was 92/100 points. DEH generally affects children in the age range between 2 and 14 years and is most frequent in boys. Generally, with unilateral involvement, the lesion originates from the epiphyseal aspects, preferentially affecting the lower limbs, in decreasing order of occurrence: Knee, ankle, and foot [8, 9]. There are three forms of DEH based on its extent and distribution: A localized form involving only one epiphysis, a classic form involving more than one area in a single limb, and a generalized or severe form involving the whole lower limb, from pelvis to foot . In daily practice, most orthopedic surgeons are unaware of this disease. Therefore, this disorder can be easily over looked or misdiagnosed as another disease such as post-traumatic osseous fragments , synovial chondromatosis, osteochondroma, loose bodies, myositisossificans, infection, tumoralcalcinosis, or anteriorspur of the ankle [12, 6]. It is impossible to differentiate between DEH and osteochondromaon histopathological basis . Some genetic tests for EXT genes can be used to make the diagnosis. These are within normal in DEH and low in osteochondroma . These are expensive tests and the diagnosisis often made on clinical and imaging basis. Radiologic features of disease are very effective for ruling out other diseases and these features are conclusive indiagnosis . 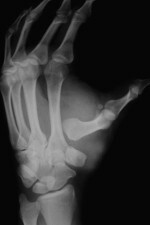 Typical view is of nonuniform bone growth, and unconnected ossification centers related with epiphyses . Synovial chondromatosis occurs in a much older age group and can be excluded by the age of the patient [6, 11]. CT is useful for the detection of small foci of early calcification or ossification within the cartilaginous mass and can identify cortical and medullary continuity between the DEH lesion and the adjacent bone. MRI examination is extremely useful for the differential diagnosis, in identifying the extension of the epiphyseal lesion, and in identifying the eventual joint deformity and the soft tissue changes associated with DEH. Furthermore, the role of MRI is important both in the follow-up and in the recurrence . Surgical intervention is more frequently required for these lesions than for solitary osteochondromas because the epiphyse allocation is often associated with pain, deformity, or loss of normal mechanical function. Excision, even incomplete resection, may result in a reduction of symptoms. Surgery is often directed at improving joint congruity to lessen subsequent development of secondary osteoarthritis; thus, treatment at an early stage of disease improves the outcome [3, 14]. Conservative treatment is recommended when there is no pain or deformity. Surgical excision should be undertaken if the lesion is painful, deformity is occurring or joint function is limited. Surgery should be aggressive and early to avoid joint deformity and stiffness . The arthroscopic approach to this type of pathology is gaining more popularity in literature; however, the rarity of the condition makes it difficult to accurately evaluate the results of arthroscopic treatment. In a recent accurate review of literature, Gökkuş et al. showed that resection is a better choice due to a large number of good results. They highlighted the chance to treat these lesions by an arthroscopic approach. The author reported early good result of the procedure with disappearance of the pain and of the limitation of range of the motion within the 1st post-operative week . In our case, young male who had delayed presentationafter6monthsofonsetof symptoms, trial of conservative management failed to improve pain, and limitation of motion for 2 months and these were the indications for surgical intervention. Arthroscopic osteocartilagenous masses excision was chosen to decrease wound exposure, decrease risk of infection being a less invasive procedure than open surgery and can help in early rehabilitation and early post-operative mobilization. Short-term follow-up showed satisfactory outcome as regards pain and range of motion that compares favorably to open surgical procedures in literature. DEH, a rare deformity of unknown etiology, is diagnosed by clinical and radiographic examination. Early diagnosis is important for the condition to be treated before the deformity becomes disabling. Surgery is considered the treatment of choice and arthroscopic approach is a valuable minimally invasive tool to achieve good outcome in these cases. DEH of the ankle is a rare deformity of unknown etiology which is diagnosed by clinical and radiographic examination and arthroscopic resection of the bony overgrowth is a valuable minimally invasive tool to achieve good outcome in these cases. 1. Mouchet A, Belot J. La tarsomegalie. J Radiol Electrol 1926;10:289-93. 2. Trevor D. Tarso-epiphysial aclasis; A congenital error of epiphysial development. J Bone Joint Surg Br 1950;32-B:204-13. 3. Fairbank TJ. Dysplasia epiphysealishemimelica (tarsoepiphyseal aclasis). J Bone Joint Surg Br 1956;32:237-57. 4. Gökkuş K, Atmaca H, Sagtas E, Saylik M, Aydin AT. Trevor’s disease: Up-to-date review of the literature with case series. J Pediatr Orthop B 2017;26:532-45. 5. Calderaro C, Iorio C, Turturro F, Morelli F, Labianca L, Montanaro A, et al. Arthroscopic treatment of 2 consecutive cases of dysplasia epiphysealishemimelica of the ankle: A 5-year follow-up report. Case Rep Orthop 2017;2017:1-7. 6. 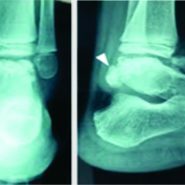 Gokkus K, Aydin AT, Uyan A, Cengiz M. Dysplasia epiphysealishemimelica of the ankle joint: A case report. J Orthop Surg (Hong Kong) 2011;19:254-6. 7. Baumfeld D, Pires R, Macedo B, Abreu-E-Silva G, Alves T, Raduan F, et al. Trevor disease (Hemimelic epiphyseal displasia): 12-year follow-up case report and literature review. Ann Med Health Sci Res 2014;4:S9-S13. 8. Wiart E, Budzik JF, Fron D, Herbaux B, Boutry N. Bilateral dysplasia epiphysealishemimelica of the talus associated with a lower leg intramuscular cartilaginous mass. 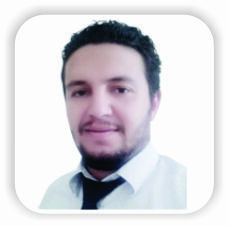 Pediatr Radiol 2012;42:503-7. 9. Rosero VM, Kiss S, Terebessy T, Köllö K, Szöke G. Dysplasia epiphysealis hemimelica (Trevor’s disease): 7 of our own cases and a review of the literature. Acta Orthop 2007;78:856-61. 10. Azouz EM, Slomic AM, Marton D, Rigault P, Finidori G. The variable manifestations of dysplasia epiphysealis hemimelica. Pediatr Radiol 1985;15:44-9. 11. Lin YH, Chou YJ, Yeh LR, Chen CK, Pan HB, Yang CF. Dysplasia epiphysealis hemimelica or Trevor’s disease: A case report. Chin J Radiol 2001;26:215-20. 12. Gökkuş K, Aydın AT, Sagtas E. Trevor’s disease: Mimicking anterior ankle impingement syndrome: Case report. Knee Surg Sports Traumatol Arthrosc 2012;20:1875-8. 13. Acquaviva A, Municchi G, Marconcini S, Mazzarella F, Occhini R, Toti P, et al. 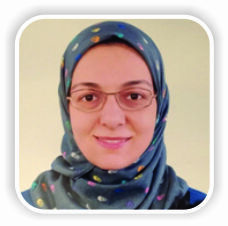 Dysplasia epiphysealis hemimelica in a young girl: Role of MRI in the diagnosis and follow-up. Joint Bone Spine 2005;72:183-6. 14. Rao SB, Roy DR. Dysplasia epiphysealis hemimelica. Upper limb involvement with associated osteochondroma. Clin Orthop Relat Res 1994;307:103-9. 15. Campanacci M. Bone and Soft Tissue Tumors. 2nd ed. New York: Springer; 1998. p. 207-11. How to Cite This Article: Fetih T N, Oyoun N A, Hashad R M. Combined Anterior and Posterior Ankle Arthroscopy for Dysplasia Epiphysealis Hemimelica of the Ankle in a Child: A Case Report. Journal of Orthopaedic Case Reports 2019 Jan-Feb; 9(1): 90-93.